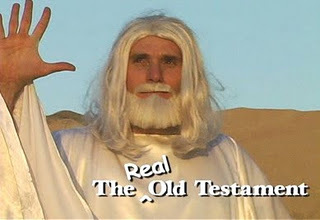 Curtis Hannum as God in his and Paul Hannum's "The Real Old Testament," winner of BIFF's first Best Feature Film award. UPDATE: Jan. 10 -- Got a nice note, posted at bottom, from Richard Roll, who directed BIFF's 2005 Best Short Film winner, "Down Dog." We're happy to post it here! 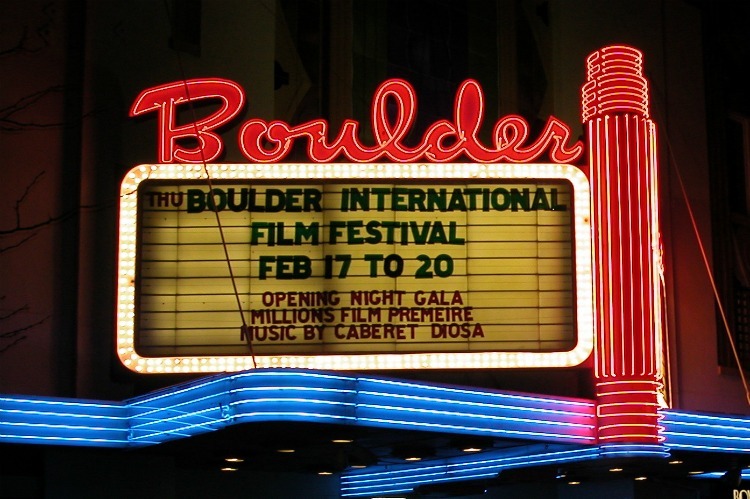 (Editor’s note: For the next seven weeks, we will offer a capsule history of the Boulder International Film Festival, year by year, written by the Director of Digital Communications for BIFF, Brad Weismann [me]. This first report is taken largely from my lengthy, detailed, pretentious, overly analytical, briar-clenched-between-the-teeth, padded-elbows, omniscient, prescient, and reverberating story written originally for Senses of Cinema [sensesofcinema.com]. Film festivals are deceptively easy to stage. They have become part of the popular vocabulary; they are a hot commercial prospect. It seems that these portmanteau events – part exposition, part marketplace, and part critical nexus – are now rising into esteem, at least in America, as revenue-generating operations, opportunities for civic boosterism, and ways to enhance the local social luster. There is no dearth of material to be screened, either. The consumerization of the filmmaking process means that anyone with a digital filming system and a copy of Final Cut Pro editing software can make a movie (several filmmakers at Boulder’s festival stated, that, without these low-budget tools, they couldn’t have attempted to create something). These questions become more pointed when the event in question is in your own home town, and you have the opportunity to watch it evolve from a fairly close-hand perspective. 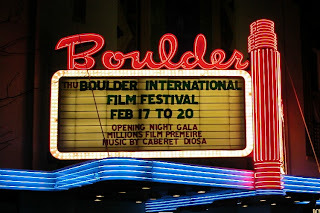 The 1st Annual Boulder International Film Festival was an act of gumption pure and simple – the dreamchild of local documentary filmmakers and siblings Robin and Kathy Beeck, who saw the picturesque environs of Boulder, Colorado as the perfect place for yet another film fest. Tapping the energies of an underutilized, below-the-radar swarm of film talent and appreciators, the Beecks swung into action. Political and business elements chipped in readily, in the hopes of stimulating the city’s moribund economy. Interestingly, there were no late-night sidebars, retrospectives, tributes, special awards, remastered Finnish silents, or other such intellectual catnip. The organizers used a single criterion for a film’s inclusion in the festival – the ill-defined concept of “great storytelling.” They mediated the inherent fuzziness of this approach by leaning on the critical skills of a 20-member panel. The Beecks assembled a cross-section of well-informed and enthusiastic regional directors, programmers, critics, associates and cinephiles, who helped winnow 650 entries down to manageable 55, the programming of which spread over four days in February of this year. BIFF founders Kathy (l) and Robin Beeck. The results were refreshingly eclectic. Films of all lengths, styles, and genres rubbed elbows, loosely organized into groups by topic or style. The opening night gala was devoted to a single film – an upcoming audience-friendly, major-market release from Danny Boyle, “Millions.” The spirit of the premiere was disturbed by Fox Searchlight goons who, zealously preventing unsavory copyists from bootlegging the movie, stripped all and sundry of their cameras and cell phones, which sat in a pathetic pile on a table in the theater lobby like children waiting to be picked up from day care. “Millions” is a sentimental fable, written by Frank Cottrell Boyce (“Hilary and Jackie,” “Code 46”) is a far cry from Boyle’s fare to date (“Trainspotting,” “28 Days Later”). It deals with a widower (the excellent James Nesbitt, “Bloody Sunday”) and his two young sons, whose move to a neighborhood of newly constructed Council houses is whimsically interrupted by the arrival of a bag of pound notes flung from a passing train – ill-gotten booty that wakes the youngest son from a reverie in which he chats with Sta. Claire (yes, folks, the pious boy can see the saints). Inevitably, the two boys have different ideas about what to do with the money before the British conversion to euros renders their haul irrelevant. Boyle utilizes his full range of cinematic devices – freewheeling cuts, impressionistic fade-ins, stop-motion, and the like – but seems caught between bringing to life a coming-of-age story and an Ealing-era comedy of manners (befuddled dad, eccentric secondary characters, screwball romance). The two don’t blend well, and despite some pleasantly funny moments, it was a bit of a damp squib. The first year’s programming was mostly made up of two kinds of film – wacky comedies and earnest documentaries. Nothing wrong with that – the decidedly populist approach to the festival’s selections made the lineup a rather accurate reflection of the local zeitgeist. The festival’s entrants were, with rare exceptions, chasing the market instead of leading or ignoring it. Nothing wrong with that -- except that it can lead to predictability. Of the documentaries, it must be said that most were head and shoulders above the level of angry advocacy that’s been common ever since Michael Moore taught us that loosely documented outrage pays. Leah Wolchok’s short “Living to Work” was a quiet revelation. Focusing on the American obsession with piling up more and more work hours, its beautifully oblique cinematography, punctuated by voiceover quotes, was sleek and understated. It exercised poetic license with restraint, communicating its points without proselytizing. 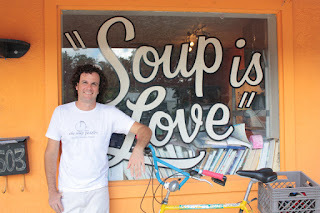 Another gem was “The Soup Peddler,” a deceptively straightforward film about David Ansel, a young man from Austin, Texas who makes his living making a delivering quarts of a delicious soup of the week for a list of nearby clients (he negotiates these deliveries across Austin’s gentle hills on a bicycle). Especially for a crowd of health-obsessed, vocally left-wing, eco-friendly Boulderites, simply seeing one man integrate so many of these principles without fuss or self-celebration was a refreshing lesson. David Ansel, the "Soup Peddler"
David Redmon’s “Mardi Gras: Made in China” was a more traditional documentary, and had a stronger impact. Redmon had the simple idea of finding the origin of the Mardi Gras beads that trinkets revelers fight and expose themselves over during New Orleans’ annual bacchanalia. He followed his nose to Fuzhou, China, where 500 sweatshop workers grind out millions of beads a year in a sexually segregated, prison-like factory. The head man, Roger Wong, led the camera team everywhere, genially spouting early Industrial Revolution management philosophy. The workers need rules, restrictions and quotas, else they will stray and slack. Redmon wisely interviewed a number of workers, who offered different reactions – some just happy to have even a menial job, and some who have struck unsuccessfully for better pay and conditions and returned to their posts with resignation. 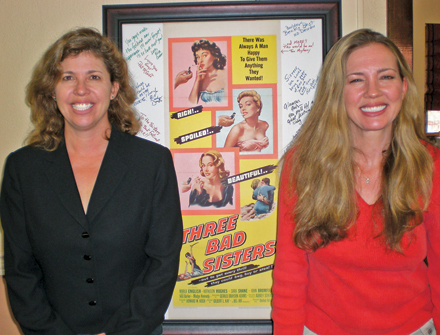 At film’s end, Redmon gave producers and consumers a chance to check each other out. He took his footage to New Orleans during Mardi Gras and projected it for the party-mad crowd, with typical results: some shrugged it off, others fell into drunken lugubriousness. He also showed the workers huddled around a playback device, watching incredulously as cavorting women collect their handiwork by flashing their breasts. It was a nice way to wrap things up without succumbing to an overtly sanctimonious conclusion. Then there was the fascinating and disturbing documentary “Searching for Angela Shelton.” The eponymous heroine takes a contrived two-pronged premise – she will speak to and film every woman in America who shares her name, and will focus on their, and her, history of sexual abuse – and makes it work through an overriding sense of evenhandedness and a remarkable ability to listen. Shelton’s work suffers from a strain of narcissism. Having started out as a model and an actress, she knows how well she photographs and takes full advantage of it, leading to some forcedly poignant footage. The therapeutic journey is a hackneyed conceit, and the screen is frequently awash with tears, but she makes it work by knowing when to step off the gas and let her interviewees take over. A more diverse set of people could not be imagined, but a surprising percentage of them have been victimized, and the act of comparing notes leads to remarkable open dialogues on the subject. 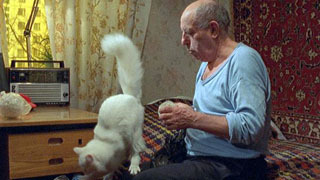 For all that, the best documentary to my mind was “In the Dark,” a 40-minute work by Sergei Dvortsevoy that simply follows the narrow life of his blind great-uncle, who lives very simply in one cramped room in the company of a surly but beloved cat. The old man patiently weaves knit shopping bags, then gives them away (or tries to) on the street. His brusque dismissal by passersby lends a tinge of Beckettian pathos to this very plainly told tale. There is no exposition whatsoever here, and the old man floats in an atmosphere of unanswered questions – how did he comes to where he is? The relentless camera work plays over his impassive features. Sergei Dvortsevoy's "In the Dark." Several local talents were represented before and behind the camera (nepotism alert: at least three members of the BIFF selection committee enjoyed screenings, and a couple of awards, at the festival), as in the slice-of-life short about an unlikely seduction, “Tiffany at Breakfast”; and “Killing Kevin,” a fantasy by Jeanne Kopeck about exterminating Kevin Costner. The outstanding entries in the live short subgenre were both musical in format. Richard Roll’s “Down Dog,” a frenetic send-up of California’s fake, predatory gurus, received its theatrical premiere here and took home the Best Short Film award as well. The real treat, however, was “Pretty Dead Girl,” which has been making the festival rounds since last year’s Sundance. A dark homage to musical comedy, it compressed a feature’s worth of density and sweep into 22 expert minutes. Shawn Ku’s highly polished work concerns a young, handsome medical intern who can only feel intimate with recent arrivals at the morgue. A revolting premise handled with an almost demure, ’30s-era delicacy, it worked out thanks to an articulate sung-through script and understated performances. Of course, a young nurse loves the mysteriously standoffish intern, and this Romeo and Juliet story plays out its predictable symmetries with verve. The runaway hit of the festival was “The Real Old Testament,” a feature by brothers Curtis and Paul Hannum that took the simple premise of giving the Bible a reality TV treatment and ran with it. The low-res digital filming perfectly captured the shaky, lazy style of the popular faux documentaries, and the incessant pulse-taking of the characters similarly skewered the prodding, vicarious nature of the genre. At the same time, looking at the sacred texts through this lens threw their incongruities into high relief, whisking away the mantle of King James prose and giving us Cain as an insufferably passive-aggressive personality; Abraham as a sycophant; and Jacob as one of the lost Stooges. A BIFF press release stated, “According to filmmaker Curtis Hannum . . . Boulder has the hippest audiences he’s ever seen. ‘They laughed at every obscure inside-industry joke and every esoteric Bible-verse joke that I had stuck in there that nobody else ever got. It’s as if I had been cloned 800 times, and that was my audience. 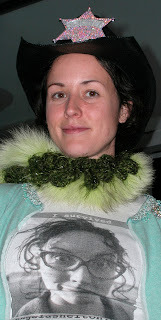 The festival ended with the documentary “The Liberace of Baghdad.” Filmed and narrated by Sean McAllister, it relates his connection to, and growing involvement with, Samir Peter, a classically trained, nationally known pianist who McAllister finds reduced to playing in the cocktail lounge of his hotel. The two strike up a friendship, a the cagey, suave Peter leads McAllister through the streets of the city, drinking, arguing, complaining, debating with his family, all the while dreaming of escape to America. Moments such as that redeemed much of the cautious programming and the occasional technical glitches that haunted the festival. The physical presence of so many of the filmmakers (26 in all) and the open, relaxed nature and small scale of the festival’s first outing made it a hands-on experience for all involved, with no hint of separation between the creators and the viewers, who freely exchanged information, drinks and phone numbers until the wee hours of each morning.